In yet another milestone at the World Trade Center site, the observatory at One World Trade Center opened to the public last Friday. Known as One World Observatory, the attraction reinstates views lost due to the tragic events of September 11. Almost 14 years later, the public can once again view the city from its highest point. One World Observatory entry canopy. Like much else in New York, the opening day was marred by long lines. Although those in line had timed tickets, those times came and went before you could even enter the building. Once inside, there were more lines as you waited to pass through the security screening. At least a pat down wasn't required. After passing through security, it's on to more lines as you make your way through corridors with a brief exhibit about the building. This exhibit feels like a lost opportunity to actually discuss the design and construction of the tower with more engaging content like models, renderings, and extensive construction photos. Stairs down to observatory entrance. One World Observatory entry from the World Trade Center Transit Hub. Almost an hour after the time designated on the ticket, its actually time to enter the "skypod" elevator that takes you to the 102nd floor in less than a minute. The animation on three of the interior panels plays like a time lapse in Google Earth, illustrating Lower Manhattan's evolution from the time of the earliest European settlers to present day. It's very well done but hard to experience while crammed into an elevator. Time lapse animation inside the elevator cab. Arriving at the 102nd floor, there is yet another video presentation to watch on a screen composed of panels extruded in and out a few inches. Scenes of New York life play for several minutes before finally the screen moves upwards into the ceiling, revealing a dramatic view towards Midtown. 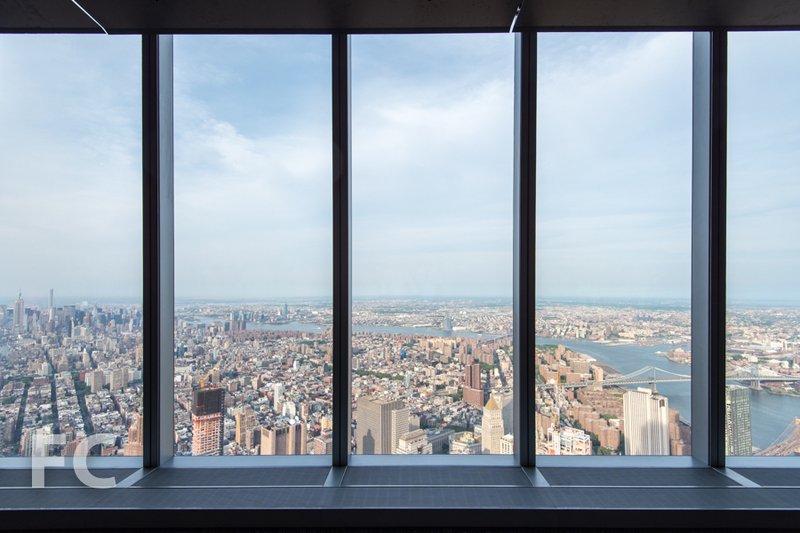 This is but a teaser for what awaits below on floor 100, where visitors can see the entire city from double height glass. Unlike other observatories in the city, you are always viewing the city from inside, which means your photos will have to contend with reflections on the windows, exacerbated by the sloped facade and unfortunate placement of mechanical ventilation grills at the foot of each window. Even so, the views are spectacular, revealing old favorites, recent additions to the skyline, and the scores of new construction underway in the city. Nearby, you get up close views of the rest of the World Trade Center Site, Herzog & de Meuron's 56 Leonard and Robert Stern's 30 Park Place. Further afield, the rapid development of Brooklyn's waterfront parks and downtown towers are on display. Looking to Midtown, the eye dances from Riverside Park,to the Hudson Yards district, to Times Square, and up to 432 Park Avenue's slender tower rising above it all. First glimpse of the views. Lower Manhattan with the Transit Hub, 3 WTC, and 4 WTC (center). Downtown Brooklyn and Brooklyn Bridge Park along the waterfront. There are many touristy attractions on the observation floors that try to complement the experience but only feel like distractions. City Pulse, a ring of touch screens that present images of the city and real time information from social sites, attempts to act as a tour guide that's tapped into the web. It's presence feels distracting, unnecessary and actually hinders visitors who line up around it to get to the windows behind. What would be more useful is if the cell service at the observatory level was a bit stronger so the visitor could actually share their experiences on social sites more easily. Service was often spotty at best. Among the other offerings, there is a restaurant and gift shop if you need to take a break from the views. After you have taken in every conceivable angle of the city and head back down the elevator, another animation shows the visitor what the area will look like with the full World Trade Center site master plan built out, including the old design for Tower 5. The City Pulse kiosk at the south viewing station. The City Pulse kiosk at the north viewing station. Undoubtedly, in the weeks and months to come the kinks will get worked out and visitors will have a smoother visit. Its wonderful to once again see this area of the city from such heights and given the pace of development, it will be an ever changing vista.